Posh striker Tom Nichols celebrates his winning goal against AFC Wimbledon with Jack Baldwin. Peterborough United striker Tom Nichols believes the club’s fans will be richly entertained this season. 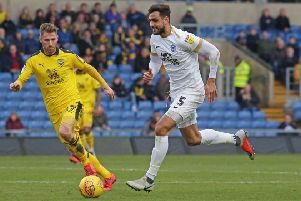 Nichols was speaking after scoring twice as a substitute in a 3-2 English Football League Cup win over AFC Wimbledon at the ABAX Stadium on Tuesday (August 9), a second such scoreline in two matches for Posh. Tom Nichols in action for Posh against Bradford City in last season's League One fixture at the ABAX Stadium. Under 3,000 watched the Dons game, but Nichols is hoping to perform in front of bumper gates when Posh host Bradford City on Saturday (August 13) and Millwall next Tuesday (August 16) in League One matches against promotion favourites. “Why wouldn’t you come and watch us?” Nichols asked. “ You are guaranteed goals and entertainment. Some of the goals might fly in at the wrong end, but that’s a risk when you play open, attractive football like we do. “We’ve scored six goals in two matches and we haven’t played that well. Just think what we’ll be like when we are flying! “We’ve played well in little bursts so far. If we prolong those spells we will start blowing teams away. Nichols was the striker who proclaimed during pre-season he could score 20 goals this season. A bold statement from a young player preparing for his first season at League One level and not certain of a starting place. His double strike against the Dons suggests his confidence is backed up by a natural goalscorer’s ability. “I was delighted to get my first goals at the ABAX,” Nichols added. “They were a long time coming and it was nice they were important goals so bring on Saturday! “I’ve always been confident in my ability to score goals and I’m playing for a team who will create plenty of chances. “Hopefully I’ve done enough to get a run in the team now. I feel fit and I feel sharp. “As a team we need to improve on our home form. We lost far too many matches at the ABAX last season. “Good home form is crucial for teams who want promotion and the fans can play a part. “We need to get the atmosphere up and get teams worried about coming here. Posh lost 10 League One home matches last season, one of the worst records in the club’s Football League history. Only on two occasions have Posh lost more home matches in a single season, the 2004-05 campaign in the old Division One and the Championship relegation campaign of 2009-10. They lost 12 home matches in those seasons. Posh have also lost 10 matches at home in four other seasons. The biggest home defeat of last season was inflicted by Saturday’s visitors from Bradford City. They won 4-0 at the ABAX Stadium against a Posh team weakened by their FA Cup exploits against Premier League side West Brom a few days earlier.